Defender Ben Mee feels the point gained at Manchester City will give Burnley huge belief going forward. The Clarets go to Newcastle United on New Year’s Day ina positive mood after coming from 2-0 down to draw at the champions on Sunday. And that result means St James Park holds no fear for Sean Dyche’s men. Mee enjoyed a memorable afternoon at the club he captained to the FA Youth Cup in 2008, and spoke of the lift the result will give the players: “It’s going to be massive for us. “If that doesn’t give us the belief, then nothing will. “To have a half like that with some great goals - especially Barnesy’s equaliser - will give us a massive boost, and hopefully we can go on to give it a good go in our next game and see where that takes us. Newcastle have only lost twice at home this season, on the opening day against City, and in the Tyne-Wear derby earlier this month, but are the only side to beat Chelsea so far, winning 2-1 in front of their own supporters. However, Burnley held the Magpies at Turf Moor at the start of the month, and Mee said: “We’ll go there without any fear. Burnley are finding their feet in terms of results - while their performances have largely been impressive. But their confidence is growing by the game, and Mee admitted: “We’ve grown into it as the season’s gone on, after a tough start to the season. “Hopefully we can keep improving and I’m sure we will. 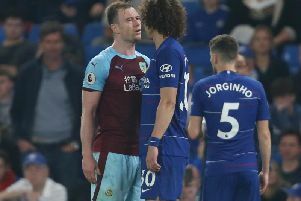 Burnley remain in the bottom three, in 19th, but in touch with their rivals at the bottom of the table, and he added: “We’d like to break clear of it but we know it’s going to be a tough battle.